If you want to change the format of the screenshots (command/Shift/3 or 4), you can do that very easily with ScreenShotFormatX. 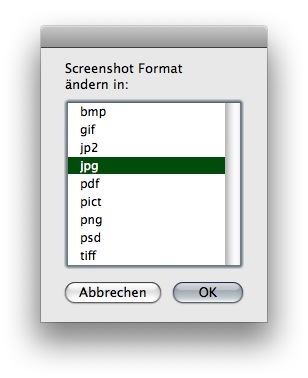 The choices are BMP, GIF, JPEG 2000, JPG, PDF, PICT, PNG, PSD and TIFF. See here the screenshot of the app (sorry screenshot is only as german version available).